We are often presented with one too many options when it comes to planning a wedding, most of which seem to be about riding the latest trend. 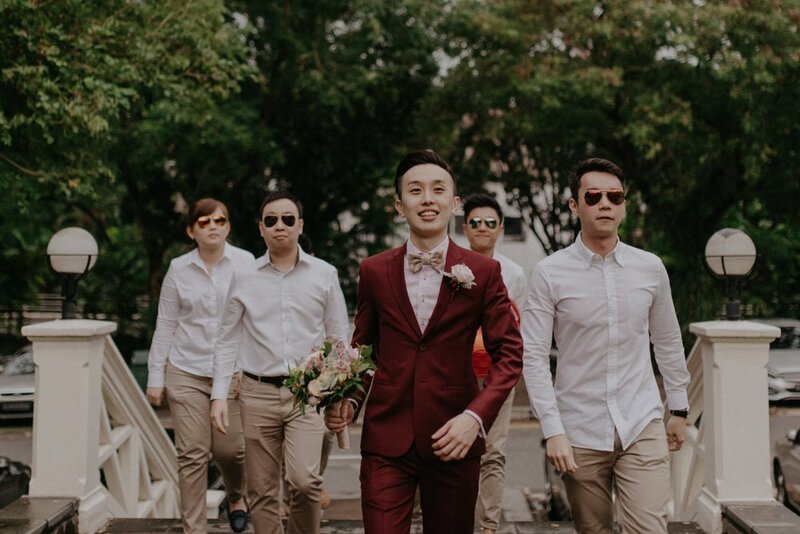 Here's a couple who created a fairytale wedding with their own devices - Sophia and Gary; who celebrated their romance in a rustic garden-themed wedding at the beautiful Hotel Fort Canning. This is one couple who enjoys getting creative together, and we can't help but feel enamoured by their teamwork and chemistry. So. How was the proposal like? Sophia: We were celebrating our 6th anniversary at the Pelican Seafood Bar & Grill when Gary popped the question! Gary: I wanted to catch the sunset when I proposed. So halfway through the dinner, I excused myself and told the restaurant manager to pass Sophia a diary that I made specially for her. After she turned her attention to the diary, I armed myself with a guitar and surprised her together with our close group of friends! 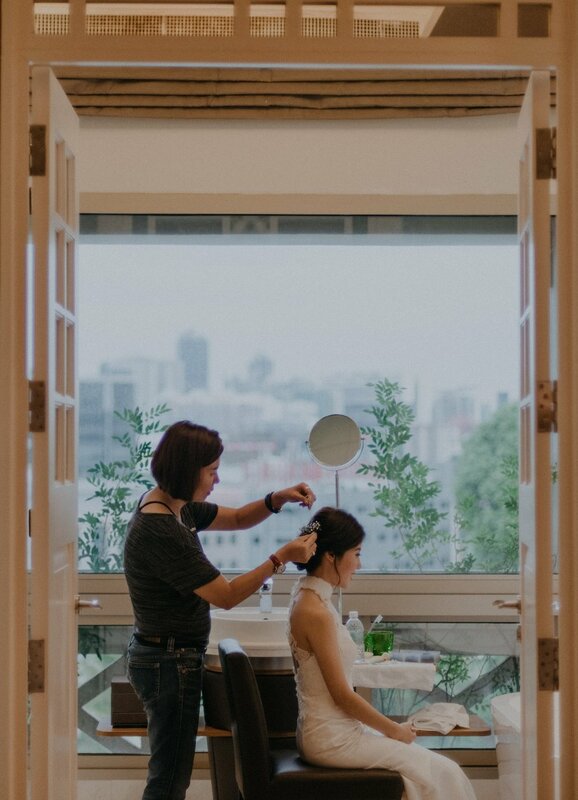 We chose for our bride a cheongsam-inspired gown, decorated with a sensual illusion-lace top. Sophia stunned in this off-the-rack number that brought out her curves, and its light mermaid silhouette allowed her a comfortable yet elegant fit. As for our groom, Gary's style was all about the unconventional. We went with a burgundy suit and pant for a sleek look. We love dressing a couple because it gives us opportunity to play up individual styles, yet complement them with each other at the same time. Gary's quirky style together with Sophia's regal beauty, was a perfect example of opposites attract - and we loved working to help them shine on their own and as a team. With a versatile location, Sophia and Gary were able to keep their wedding celebrations cleverly in one place. The couple saw their wedding transform from day to night with help from friends, while keeping true to the theme. "For our solemnization, we opted for a simple floral arrangement with copper pipe backdrop. 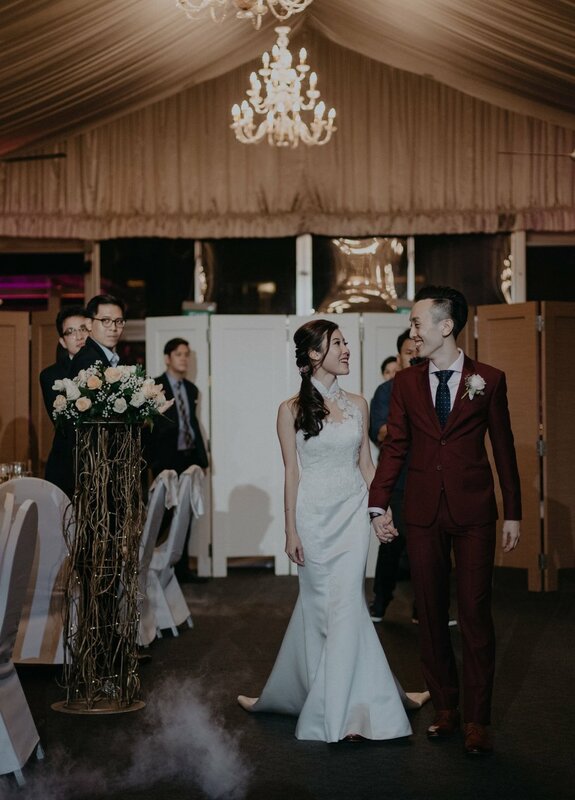 And as we held our banquet inside a marquee, we went along with the same theme featuring vintage props on our guest well-wishes table and reception." It's true when they say couples who plan together, stay together. "Every little detail really added up in our wedding planning journey! We enjoyed every moment, from the sourcing of our vendors to making our own wax seal stamp! It’s fun and rewarding and most importantly, we have learnt how to compromise with each other’s needs." Later that evening, Sophia opted for an A-line gown of millennial pink and silver accents, complete with 3D lace and flower appliques. Perfect to sweep Gary off his feet! "Pearlyn was our designer and she was fantastic! She would give her most earnest opinions on what works well for her bride and groom. We always feel at ease because we know we are in good hands!" Blessed marriage, Sophia and Gary! Thank you for choosing Amanda Lee Weddings.